My return trip which started from Phnom Penh went rather smoothly. I pedaled towards the Thai border on the southern side of Tonle Sap lake, stopping mainly to eat and sleep on the way. In the afternoon I sometimes had a bit longer break to escape the heat, which exceeded 35 degrees on some days. In Phnom Sampeau I was once more hosted in a Cambodian family, this time a restaurant owner with his wife and a few months old son. He was searching for a foreign partner to open a guesthouse in Siem Reap. I wasn't ready for that but it was still interesting to talk with him. Near the town of Pailin I crossed the border to Thailand and met my friend Phisit again in Chanthaburi. We visited once more his sister's fruit garden and returned to Phanathikhom. After one day of relaxing there I had my flight back to Helsinki from Bangkok airport. Once more I had to try to get through without overweight fees. I put my luggage on the scale, with the bicycle only halfway there — the display showed 23.3 kg and the girl behind the counter just smiled as they always do in Thailand. I smiled back and even the extra bag containing a selection of exotic fruits went through without problems. 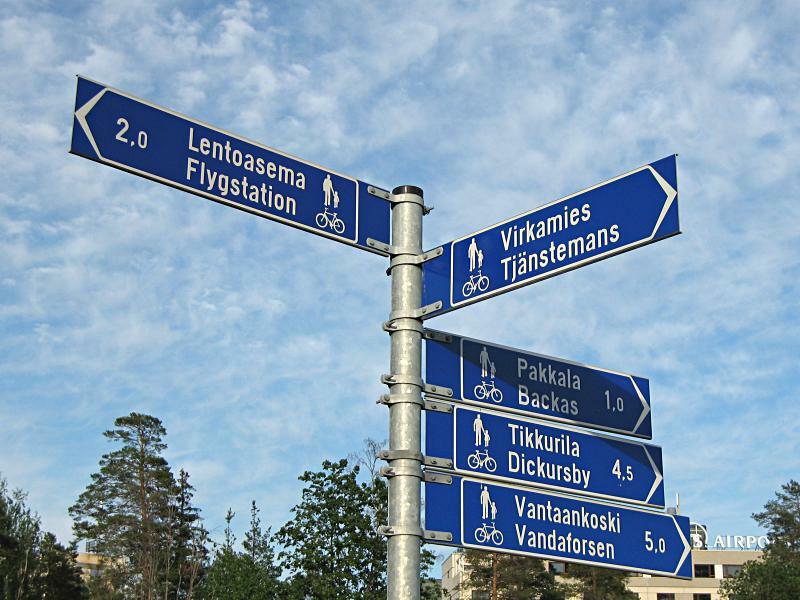 In Finland I started by cycling from the airport to my parents' place with my friends Mikko and Sami. I wore only a t-shirt and shorts, which was a mistake resulting in a flu for the next couple of days. Mikko and Sami weren't suffering from cold in the same outfit so apparently my resistance to less than 30 degree weather had weakened in the warm countries. In Helsinki it was surprising how easy it is to fill again your non-existing calendar. During the first six days I already met friends from the MikroPC magazine, hosted two French cyclists for a couple of days, visited my grandparents near Kotka and participated in my friend's graduation party. I also moved to my apartment in Haaga (in Northern Helsinki) and started to carry stuff back in. I began with the most important things such as installing the cd player, amplifier and loudspeakers. Otherwise arranging the flat hasn't progressed much, but it doesn't matter: I've got plenty of time to do it during the summer. I won't stay in Helsinki for the whole summer, however. For the midsummer I'll head to Lapland beyond the arctic circle. Believe it or not, although I've lived in Finland for almost all my life it'll be the first time for me to experience the real midnight sun. I've seen plenty of nights during which it never becomes dark, but I have never been far enough in the north during the middle of the summer to see the sun up in the sky still at midnight. In Phnom Penh, the capital of Cambodia, I met Päivi and Santeri, two Finns who describe themselves as homeless loiterers. Three years ago they decided to give up their careers in Finland and start a new life together, traveling around the world and stopping where they feel like staying. Now they had parked in Phnom Penh for an undetermined amount of time. Santeri was an old friend of mine, but I met Päivi for the first time. Päivi and Santeri were renting a room in a guesthouse, so when I arrived I took a room in the same place. Then we went to their favourite Chinese restaurant for a dinner. I was actually surprised that Päivi and Santeri seemed to go almost always to the same two restaurants, one for breakfast and the other for lunch or dinner. Occasionally they bought something to eat from a supermarket, but that was limited to cold meals only as there wasn't any kitchen in the guesthouse. If I had stayed several months in the same place I would have certainly tried to learn the local language and seek for local friends, but Päivi and Santeri didn't do that either. They seemed to be happy by simply having each other. I spent nine days in the city, and as you might already guess the visit was not packed with sightseeing. Mostly we were just discussing various things, walking around, listening to music, eating and sleeping. I did check out the Royal Palace and the Toul Sleng museum, which documents the atrocities of the infamous Khmer Rouge regime in the 1970's and functioned as a torture prison at that time. I had also plenty of time to take care of a few errands, such as getting photos printed and sending them back to people who had kindly hosted me or otherwise helped me earlier during my trip. I found the right stall at the Orussey market to deliver the photos taken at Kompong Khleang. The travel advisory of the Foreign Ministry of Finland warned about armed robberies in Phnom Penh. I didn't feel unsafe or threatened at any time, although I didn't push it by hanging too many nights out in bars. The most ferocious armed robbery attempt was the one in the picture above. The kid was trying to sell us flowers, but we were bad customers and didn't buy anything. Then he peeled all the petals off his two remaining flowers, left them beside us and went to the river to play. We gave one of the stripped flowers to a water bottle salesman, and when the kid came back he attacked Santeri with his plastic knife. Both were laughing. 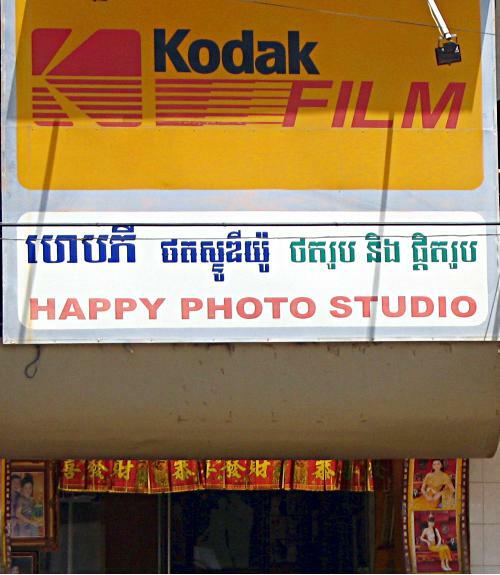 A funny detail one cannot miss in Cambodia, especially in the capital, is services featuring "happy" or "lucky" in their names. Cambodians themselves smile and laugh quite a lot so maybe it's their trick to get grumpy westerners a bit happier too. 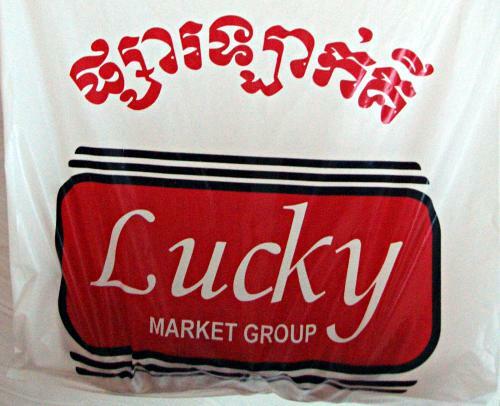 You could stay in Happy Guesthouse, or maybe you'd prefer Big Luck Hotel or renting an apartment at Nokor Lucky? Surprisingly, McDonalds is not in town (! ), so you cannot treat your kids to their happy meal, but you can try Lucky Burger instead. 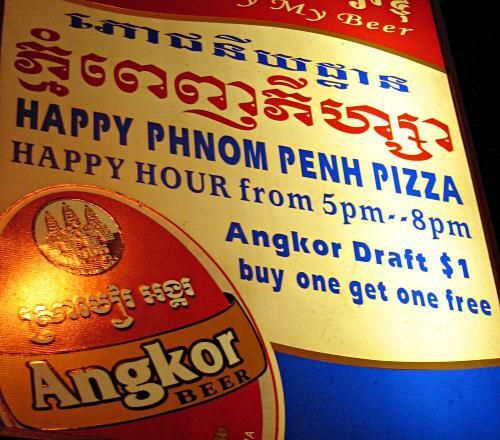 Alternatively, there are plenty of pizzerias, such as Happy Phnom Penh Pizza, Happy Herb Pizza, Special Happy Pizza, Pink Elephant Pub and even Ecstatic Pizza. Their happy meals are quite different from those you could get from the previously mentioned well-known fast food chain. 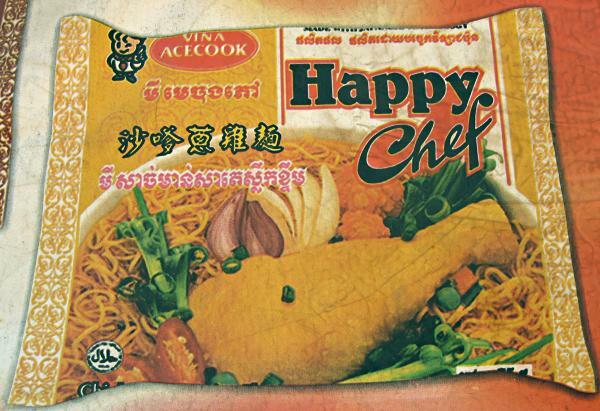 ;-) For self-catering, there's always the convenient Lucky Market and Happy Chef products. Need a visa extension? You might consider applying in Lucky! Lucky! 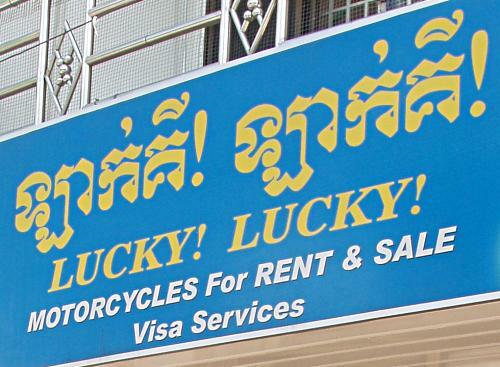 Visa Services, which also rents motorcycles, by the way. Lucky! Lucky! Two or Happy Travel and Web might also help. For the Internet, there's an even happier option: Happy Happy Net. Don't forget to smile if you have your photo taken at Happy Photo Studio — if you feel sad have a drink first at Happy Beer Garden. However, I'm not sure if you can get Happy Beer there. After some happy days with Päivi and Santeri, I started cycling back towards Thailand. Unlike my friends, I still consider Finland my home and have booked a ticket for a Bangkok-Helsinki flight on June 10th. While pedaling through the Cambodian countryside, already on the way from Siem Reap to Phnom Penh, I picked up a new habit. Instead of buying soft drinks or water bottles I stopped at watermelon stalls. The melons sold for 0.05-0.20 euros depending on size and seller, were tastier and cheaper than any canned juices and about the same price than equivalent amount of bottled water, plus there was one less plastic bottle left behind. Another nice natural alternative was sugar cane juice, straight from the press, served with ice. Only 30 km after Siem Reap I took a right turn from the main road and rode towards Tonle Sap, the largest freshwater lake in South-East Asia. 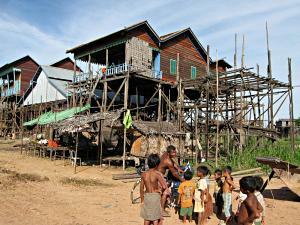 By the lake lies a village called Kompong Khleang, where the inhabitants get their living mainly from fishing. I arrived in the afternoon and there were no guesthouses so it was again a splendid opportunity to meet locals. The water level of Tonle Sap varies greatly. During the dry period the water flows to Mekong river and the lake becomes smaller and smaller. The monsoons make Mekong to flood which reverses the flow and the water level rises by almost ten meters, also greatly enlarging the area of the lake. This variation was reflected in the design of the Kompong Chleang village. There was a tiny center on top of a small hill with a pagoda, a market and a couple of bars, but most of the houses were spread on both sides of one single road stretching several kilometers. There was a wide canal next to the road providing a waterway to the lake. The houses were built on top of long wooden poles, keeping them above the water even during the floods, when the lake fully covers the road and all the surroundings. During mid May the water level was still low, so the road was easily accessible by bicycle. It was rather quiet, as many inhabitants spend most of the time fishing and living in floating houseboats on the lake, returning to their main houses only occasionally. Those who remained were looking at me rather curiously. Already on my way towards the center I was invited to stay in one of the houses. The family didn't speak any English but we managed to communicate enough that they realized I didn't have a place to stay and I understood their sign of pointing up at the house and sleeping. It was still early so I gestured that I'd go to the center first and come back later. In the center about two kilometers away I met a guy who spoke English. He was living in Siem Reap but visiting his home town. We discussed for a while and he said that I could stay at his place too. It would have been easier of course because of the common language, but I didn't want to be impolite and ignore the first invitation so I returned to the family I had met earlier. The family was a relatively young couple with a less than one year old son, living in the house with their grandmother. During the evening also some sisters or other relatives came for a visit from neighbouring houses. They welcomed me warmly and offered me dinner, which consisted of several different kinds of fish, rice, and some vegetables. With the lack of common words, photographs were once again the easiest way to communicate. I showed my set of family photos and Finnish sceneries and got to see their wedding album. It was quite different from Finnish wedding albums: a huge number of photos where the married couple was posing in different clothes in front of artificial sceneries. The buddhist school teacher in Rohal had also shown his wedding album and it was very similar. In both cases the couple also wanted to give me one of the wedding photos and I gave a photo of myself in return. Like most of the houses in Kompong Khleang, they had well enough living space for all family members, but luxuries were limited. Water could be pumped up from the lake using a hand pump, but during the rainy season they rather collected rain water and used that for both washing and drinking. They had electricity from a 12 volt battery, powering up a couple of small lamps, a television set and a mobile phone charger. Landlines are nonexistant in Cambodian villages, but mobile phones are filling the gap and becoming more and more common. Even phone booths are virtually all operated by mobile phones. Early next morning the father of the family reached his younger brother, who was studying in Siem Reap and who could speak English. He borrowed a motorcycle from a neighbour and came to help in communication and to spend the Sunday in Kompong Khleang. I also decided to stay for the day and one more night when I was invited to do so. We went for a boat ride to the lake and saw also the floating part of the village. They asked if I could pay for the gas and I was of course happy to do that. With the English speaking brother it was easy to clarify some things which had remained a mystery the previous night. For example, I had asked my hosts to write down their address so that I could send them photos later. They could read and write but sending and receiving letters seemed to be an unknown concept to them. Now I heard that there was no postman coming to the village. First they suggested that I could send the photos to the brother in Siem Reap by bus, but then they remembered a friend who had a shop at a market in the capital city Phnom Penh, where I was heading. I got the number of the shop and the name of the friend I could give the photos to. Cambodia is not a very well known travel destination except for one place, the world famous Angkor Wat. Actually Angkor is only one of the temples in a large area of bigger and smaller buildings of worship, constructed by the Khmer emperors during 802-1432 AD. Siem Reap is the city located closest to the temples and together with Angkor it's the tourist headquarters of the country. Foreigners have to pay to enter the temples, prices being 20 U.S. dollars for a day pass, 40 USD for 3 days and 60 USD for 7 days. Guidebooks recommended three days but I felt that exploring every single temple ruin was not my main desire and went for one day only. As usual, I skipped all the moto, tuk-tuk and taxi driver's offers and made my own tour by bicycle. Angkor Wat earned it's place amongst the truly impressive buildings I've visited. Huge in dimensions, yet fine in detail and every carved image being subtly different from each other, it was fascinating to sit up there in a quiet corner and imagine what the place had looked like in all its glory during a grand ceremony. Another temple, Bayon, featured the coolest large carvings of the smiling face of god Avalokiteshvara, or perhaps the king Jayavarman VII who built it. 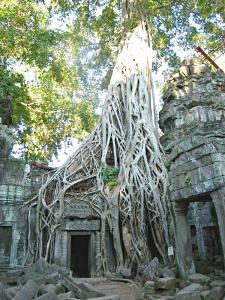 Still, my favourite was Ta Prohm, which had been left in a more natural state, with large trees taking over the ruins. 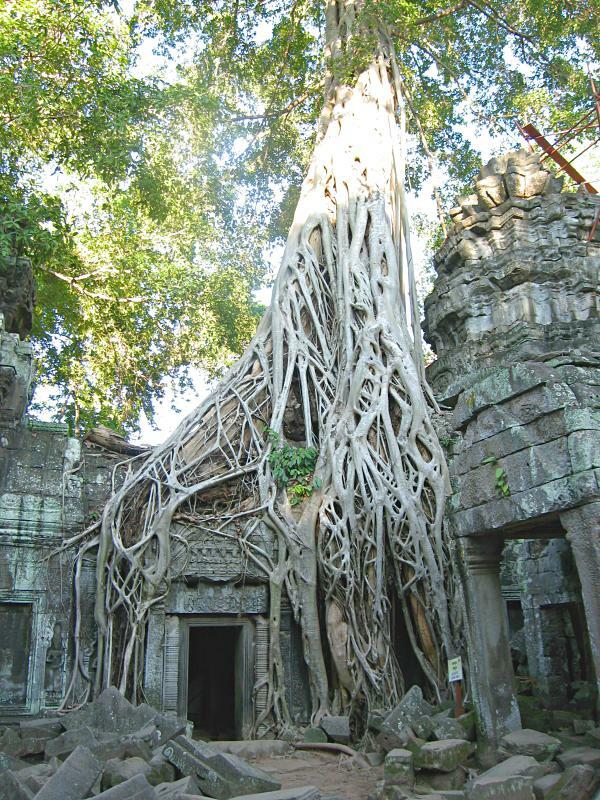 The picture above is from Ta Prohm. The city of Siem Reap was much less interesting. It was of course convenient by offering a large range of hotels, restaurants and other kinds of services, but I wasn't too eager to go pub crawling on the bar street with other westerners. I did go for dinner in one of the tourist restaurants and have to admit that their fish amok, a coconut flavored curry served with rice, was really delicious. In supermarkets trying to cater for western taste went a bit too far. It felt utterly silly to stare at a line of expensive tropical juices — imported from Greece! Unable to find any local product I walked back to the guesthouse and ordered a big glass of freshly squeezed pineapple juice. In my series of "let's try different massages of the world" (which started in India) this time it was Seeing Hands 4 at Siem Reap. Cambodia is full of different kinds of NGO projects and Seeing Hands belongs to the more successful efforts. Blind people are trained to do massage so that they can earn a living in this country where social aid provided by the government is practically nonexistant. The style was Shiatsu and Anma, at least that's what it said on the sign. A very good experience, definitely recommended. Border crossing from Thailand to Cambodia was easy, at 7:40 in the morning I didn't have to queue at all. The 160 km ride from the border to Siem Reap took three days and traveling by bicycle once again guaranteed many many smiles from locals. All kids happily greeted me by shouting "Hello" which reminded of India, but they usually didn't run to surround me here. The road was bumpy almost all the way and partly muddy but not so muddy that vehicles would get stuck in it — in other words okay by Cambodian standards. Scenery was mostly fields but very beautiful ones, covered by a layer of water as far as the eye could see. When I arrived to Sisophon 50 kilometers later there was a wedding party going on. 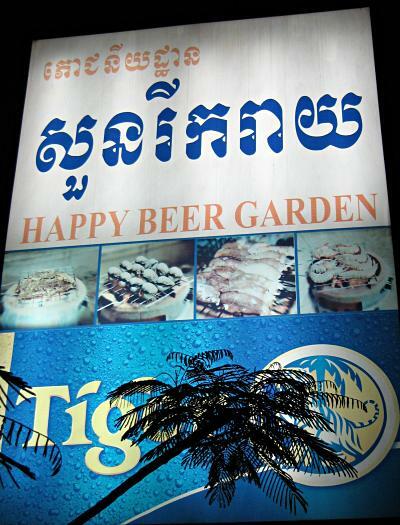 They invited me to join so I had a jump start into Khmer culture and a great chance to taste many kinds of local food. Drinking habits had common ground with Finland: when somebody wanted to have a toast with you the desired way to go was bottoms up. It was done with beer instead of vodka though. Partying was intensive, including almost rave party style dancing, but short. The whole thing ended already by late afternoon and everybody went home. Following morning I pushed through the mud about 30 kilometers and arrived in a village called Rohal. There was a pagoda or a wat as they are called in Cambodia (essentially a buddhist monastery) and I went to take a look. Some people on the yard waved that I should go inside a building, where a group of young monks were studying buddhist scriptures. My arrival obviously disrupted the class, but it seemed to be a pleasant kind of disruption. The teacher spoke some English and started teaching me Khmer in return. I was asked if I'd like to stay at the pagoda and I answered I'd be happy to. They gave me a private room which had a basic bed with a mosquito net and a small table. I washed out the sweat of the day and entertained everybody by changing a snapped spoke from the rear rim of my bicycle. There was only one older monk and a group of about 30 children and teenagers, I'd guess most of them were between 12 and 16 years old. In Cambodia it's quite common that boys become monks for a couple of months during that age, returning to normal life after the period of monkhood. In this particular pagoda some of the boys were apparently orphans and lived there for a longer time. The teacher interestingly was not a monk but a married man who stayed outside the pagoda in the village with his wife, father-in-law and his family. He invited me there for a dinner. The food was rice, some fish and a green-coloured soup containing many different kinds of herbs. The soup had a quite distinct flavor from anything I had eaten in other countries, but it was really good. In Cambodia that kind of soup seems to be fairly common as I've come across a similar dish in a couple of roadside cafes, but the one at the teacher's house was the best I've tasted. Life in the pagoda started early. I got up at around 5:40 and was certainly the last one. Beginning at around seven there was some kind of ceremony in the open space with a couple of hundred villagers gathering at the site. It was about paying respects to the Buddha but if I understood correctly (the teacher's English skills were quite limited) the reason for so many people that day was connected to someone having committed some kind of fraud. People brought various kinds of food which were then eaten together after the worship. After that I continued my trip towards Siem Reap, a city located close to the world famous Angkor temples.